We offer this as our standard fulfillment option with no extra cost to our customers. Per your request, goods will arrive folded, in a heat sealed poly bag, with a size sticker in the bottom right corner. Your success is our main goal. Taking the extra step in fulfillment will guarantee that your garments will be retail ready from the moment they land. Custom Pad Printing is offered for businesses that want to take the extra step in furthering their branding. We help you design the details that will make your brand come full circle. Different clothing brands have different personalities. It makes sense to have hang tags that match them. With a wide selection of different sizes, shapes, and cardstocks, we are sure to find a combination that will match both your product and your brand persona. They help reinforce your brand message, describe important characteristics of clothing, or convey other messages about your company. 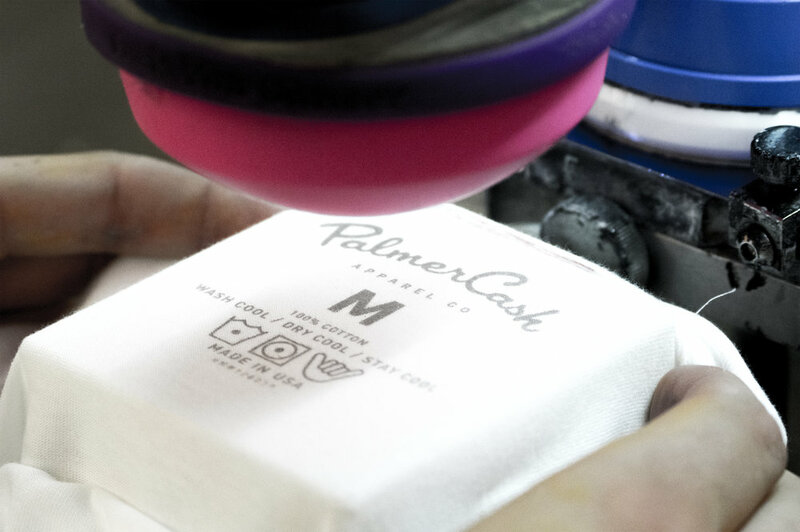 We at PalmerCash will help create the look that you're after. All garments will arrive at your door, with tags attached, ready to be placed in the hands of your customers. Woven labels add a level of class and sophistication to your clothing; it goes further than just being stylish or trendy. We want to help you create a garment that is eye-catching. Something that will make your customers stop and look twice. This label will be the lasting message for your brand. Simple logo, or complex artwork, create a feel of upscale for your business.